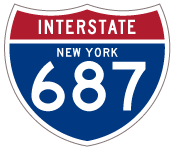 The planned western terminus would tie Interstate 687 into the Northway just south of current Exit 4. There is no Exit 3 of Interstate 87, due to the fact that it was slated for Interstate 687. Westbound Interstate 90 at Exit 5A for Corporate Woods Boulevard. This trumpet interchange was built for the Northway-Northside Connection. The exchange serves local traffic interests to Corporate Woods between I-90 and Shaker Road. Photo taken by Douglas Kerr (01/20/02). 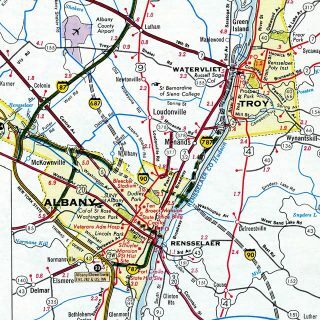 Albany inset from the 1967 Rand McNally North American Road Atlas. The Northway-Northside Connection first appeared as an unnumbered proposed line in the 1965 Rand McNally North American Road Atlas. An I-687 shield was added to the proposed route in the Albany inset of the atlas in the 1967 edition. It remained on the map until the 1975 edition. The Corporate Woods interchange remains as the lone piece of infrastructure built for I-687.1 It provides a high speed entrance to a 30-mile per hour arterial through Corporate Woods business park. “A few facts, controversies, and quirks from the Northway’s history.” All Over Albany, May 27, 2015. Page updated May 28, 2015.